I threw out a few options for Abby’s cranial playlist — while stealthily spreading jam on her toast — until she finally settled on The Black-eyed Peas “I Gotta Feeling,” which her class is performing at her school’s “Field Day” next week. And then I returned the jam to the fridge way in the the back…behind the TraderAdes, behind the mustard, behind a high wall of pickle jars. Slice up a medium bushel of de-stemmed strawberries (about 1 1/2 cups) and add to a small saucepan with about 1/3 cup sugar and the juice from one juicy lemon. Let the mixture cook on low heat for about 10 minutes until everything is syrupy. Cool, then whirl in a food processor for about three seconds. Store in a clean jam jar for up to a week. 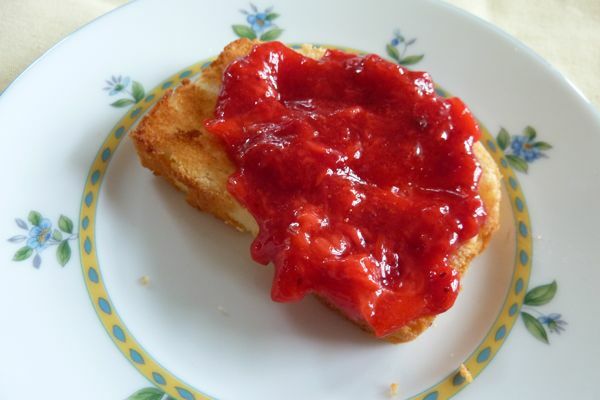 Spread on toast (or toasted pound cake, as shown above), waffles, pancakes, or drizzle into vanilla ice cream for strawberry sundaes. Speaking of Strawberries: This week is “Strawberry Week” at Babble’s The Family Kitchen. All week long: parfaits, pies, granitas, ice cream, fools! Would you say that this formula could be used for other fruits (blueberries, cherries, peaches)? Because I love homemade jelly/preserves but I refuse to do canning – too time sucking and really, how long does this stuff need to last? In my house… not long! It’s too yummy to be sitting around! Jill – I’ve never tried it with any other fruit, but I would imagine it would work with blueberries and peaches (peeled peaches). Anyone else have an educated opinion here? I don’t officially can either. It’s not a statement of any kind — it just intimidates me. By the way in the picture of the kitchen in the post about the red chairs, the kitchen looks fabulous. Just made this last night – YUM, YUM! The strawberries at my local farmers market were PERFECT this week. I’m going to try it with cherries next! I made this on Sunday and ate it with the Barefoot Contessa’s raisin scones. My husband and I sat with the doors of our apartment open overlooking the canals of Amsterdam. The perfect Sunday morning breakfast. Thanks!